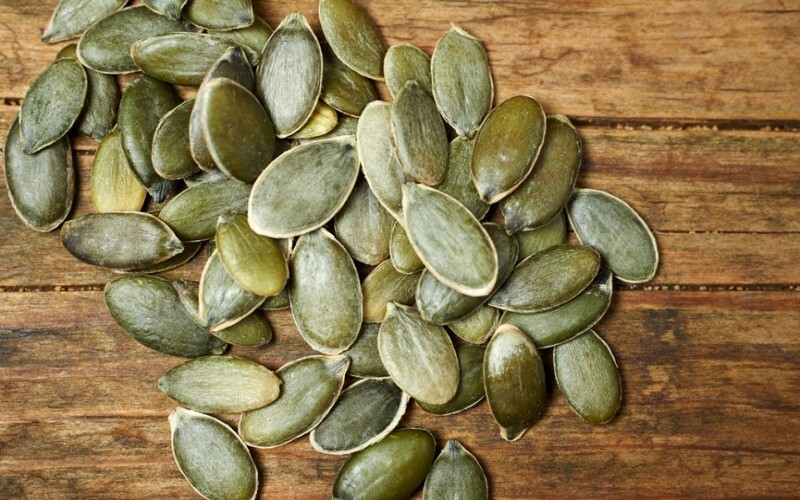 Pumpkin seeds are a rich source of tryptophan which allows for healthy sleep cycles. Munch on these, they’re a dream! Origin USA. Pumpkin seeds are highly nutritious seeds with a host of health benefits. They are the perfect on the go snack, are high in antioxidants and have important amino acids. 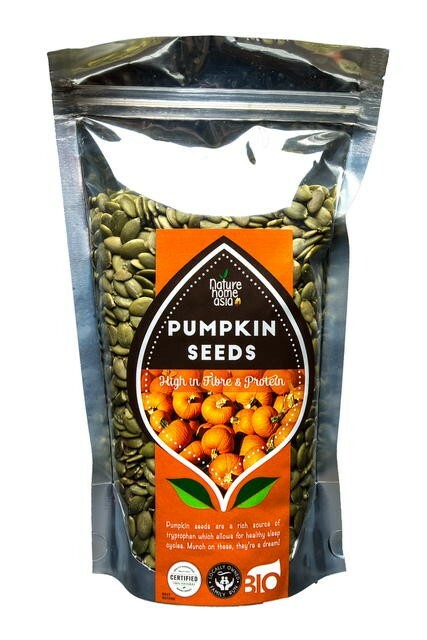 Pumpkin Seeds are great seeds to snack on, they really curb your hunger and work well in trail mixes and so many recipes. Pumpkin seeds (pepita) are edible kernels of the fruit pumpkin. The seeds, in-fact, are concentrated sources of many health-benefiting vitamins, minerals, anti-oxidants, as well as an important essential amino-acids such as tryptophan, and glutamate. Pumpkin fruit is a squash-like gourd in the Cucurbitaceae family of vegetables native to Mexico. In Central America, hulled and gently roasted pumpkin kernels are popularly known as Pepita. Crunchy, delicious pumpkin seeds are high fiber, vitamins, minerals, and numerous health promoting antioxidants. Pumpkin seeds have good quality protein. 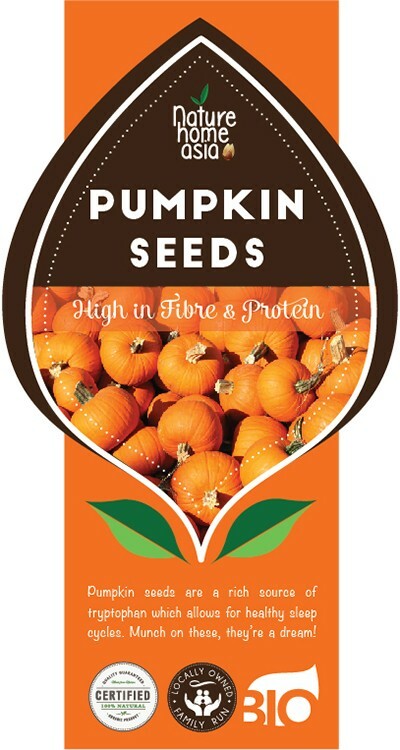 100 g seeds provide 30 g or 54% of recommended daily allowance of protein. In addition, the seeds are an excellent source of amino acid tryptophan and glutamate. Tryptophan is converted into serotonin and niacin. Serotonin is an essential neuro-chemical often labeled as nature's sleeping pill and helps prevent depression. Glutamate is required in the synthesis of butyric acid (GABA). GABA is an anti-stress neuro-chemical in the brain, which helps in reducing anxiety, nervous irritability, and makes you feel relaxed. Pumpkin seeds are also a very good source of antioxidant vitamin E, they contain about 35.10 mg per 100 g (about 237% of RDA). Vitamin E prevents tissue cells from the effects of free radicals. Pumpkin kernels are also an excellent source of B-complex group of vitamins such as thiamin, riboflavin, niacin, pantothenic acid, vitamin B-6 (pyridoxine) and folates. Along with glutamate, niacin enhances GABA activity inside the brain, which in turn reduces anxiety and nervous irritability. They are also high in calcium and iron. So these are your feel good happy seeds!! Snack on them during the day to keep you feeling full, sprinkle them on your cereal or yoghurt, add them to energy balls, trail mixes, use them in cakes and power bars and keep them live raw and un-roasted to get all their benefits. They taste great on salads too, and you can even sprinkle them on pasta, add them to raw pestos and anything that you want to have a delicious nutritionally packed crunch. Thanks pumpkins...see you next Halloween!